The new year has arrived and smart homes will be a large part of this year and as we continue to move into the future. The Consumer Electronics Show of 2017 (CES) is sure to showcase several new products for smart homes. Many believe that creating a smart home is extremely expensive. Today, however, we will show you one product to make your home a tad bit smarter without breaking the bank. The Philips Hue White and Color and White Ambiance Starter Kits can help start home owners on their way to making their home a little smarter. The Philips Hue White and Color Starter Kit comes with 3 LED lightbulbs that can illuminate any color, the proprietary Philips Hue Bridge to connect the lights to your home Wi-Fi network, and retails for $199.99. The White Ambiance Starter Kit comes with 2 LED light bulbs that can change to any shade of white, the Philips Hue dimmer switch, Philips Hue Bridge, and will set you back $129.99. It should be mentioned that a Starter Kit MUST be purchased if you do not already have one as the Philips Hue Bridge is required to use the lights. 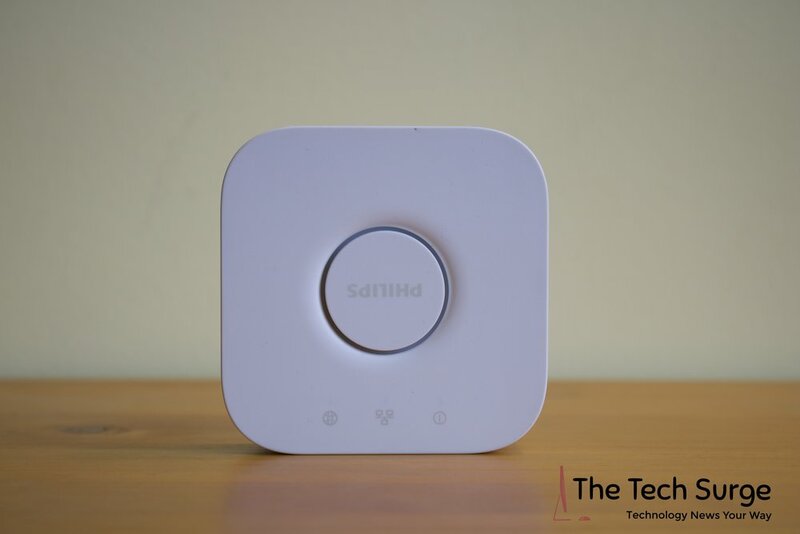 A closer look at the proprietary Philips Hue Bridge that connects your new smart lights to your home Wi-Fi network for easy control. The lights themselves are very convenient to set up. Users need to place the bulbs into a normal lamp or overhead lighting socket, power and connect the bridge to a Wi-Fi Network, and download the Philips Hue iOS or Android application to finish connecting to the lights. Set up for me personally worked exactly as Philips advertises. I did place two of White and Color bulbs into an overhead socket, and at times have had the lights not turn on or not connect to the bridge itself. However, after a few flicks of the light switch or a few minutes they did work again. It is important to note that the original light switches are meant to stay on at all times, in any light fixture. Turning a lamp or light switch off leaves the light without power and thus any of its smart capabilities, and defeats the purpose of the light itself. Turning the switch off will also wipe the last used color of the light bulb and once its turned back on it will turn on to a default color, which is not changeable at this moment. The lights themselves are LEDs are very energy efficient. They will draw a small amount of power to stay connected to the bridge, but will not raise your bill more than a dollar or two a month especially if you are replacing incandescent lights. A close up of the actual White and Color Philips Hue lightbulb. The smart light's footprint is similar to that of a regular LED light bulb. The Philips Hue lights also have vacation settings, allowing users to have the lights turn on and off at certain times throughout the day while they are away. Users can also set up a bedtime and morning routine to have the lights slowly dim at night and slowly brighten in the morning. Lights can also be arranged into rooms that can be created in the Philips Hue application and individual rooms or even lights inside the various rooms can be turned on or off. Lights for the entire house can be turned on and off with one switch in the application itself. The Philips Hue application also has a set of scenes for the light including reading lights and night lights. Users can also create their own personal scenes based on their photos. Users can also set up widgets for their favorite light settings to use in their Notifications View or on their Apple Watch running the Philips Hue application to have quick and easy access to turn lights on and off. The lights also work with third parties like Apple’s HomeKit, Nest, SmartThings, Amazon’s Alexa, the new Google Home, and many more to make turning lights on and off, changing their color, and changing their brightness even easier. Expansion with the Philips lights are also vary convenient. Once customers have the Philips Hue Bridge, any light or accessory can be purchased. Philips makes a Lightstrip, a Phoenix Light, a Hue Go, a Dimmer Switch, and of course White Ambiance, and Color light bulbs by themselves. Additional lights can be added within the application and can be added to a specific room or as a standalone light in the house. The Philips Hue lights are a great choice for home owners that want to make their home a little bit smarter. They are most defiantly not the cheapest smart LED lights on the market, but their features, expandability, and compatibility with a range of devices and services make the lights worth their cost. Their variety in light design and style also gives customers unlimited design combinations and potential.